I think it might be time for Muammar Qaddafi to call it a day. I guess he was so excited to be making his debut at the United Nations today that his speech may have sounded...a little off??? ...He then turned his wrath on to America, Britain, France, Russia and China - the permanent members of the security council, or "terror council" as he renamed it. Their veto was tantamount to terrorism. "This is terrorism, like the terrorism of al-Qaida. Terrorism is not just al-Qaida, it takes many forms." In case the point was lost on anyone, he tore up his copy of the UN rule book. Having thus abused and alienated 99.99% of the world's top diplomats, he suddenly changed tack, heaping praise and devotion on the one man he appears to respect. "Now the black man doesn't have to sit in the back of the bus, the American people made him president and we are proud of that. We would be happy if Obama stayed president of America forever." Poor Barack Obama. 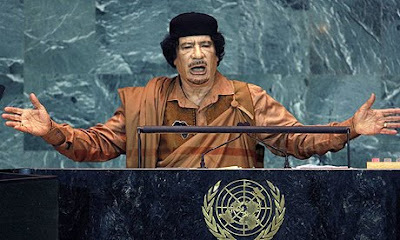 Having Gaddafi applaud his stance towards the world must have been as pleasing as being congratulated on his domestic policy by the leader of the birthers, who insist Obama was not born in America. As you all know already, Twitter is all the rage these days, especially among us digital activists. Recent world events such as the presidential election in Iran and the 2008 Mumbai bombings have made many wonder aloud again if Twitter's powerful citizen-driven info-sharing is actually activism. Agus Sari, blogger behind The Goose, recently had musings about how the popular social media tool was used during Jakarta bombings. From #idonesiaunite create a simple one-stop to finding information quickly. What was unique about this incident were the offline connections made afterward. A local Jakarta radio station hosted a party for all the "Twitterati" who participated in the online activism to put faces to the Twitter handles and hastags, and start "a movement beyond the social network." There is also a website dedicated to building upon these relationships. "There are many other 'causes' that will make use of the new medium," said Sari. "And with the internet universe being flat, the social network media will also become the democratizing means for Indonesia, and for the world. The tenet “one person one vote” will be closer to your heart, and your Blackberry." You are what you eat: Callaloo! And for my last trick...for now, I will show you how to eat green. My favorite dish is callaloo, a leafy vegetable originating from the Caribbean, cooked with onions, garlic and tomatoes. All of these items can be purchased at a farmers' market (Go Local!). Some people like to also add saltfish, pork or more vegetables, like carrots, okra and red peppers. 2. saute tomatoes, onions, garlic, salt and pepper in a large frying pan with a tablespoon of olive oil for 5-7 minutes on a low fire. Voila! I am master of the eco-kitchen! 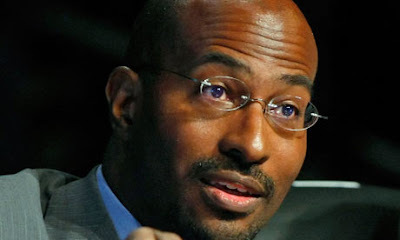 All I have to say about this is how interesting Van Jones, the man put in charge of pushing forward the green economy on President Obama's behalf, becomes unemployed the day before Labor Day. "On the eve of historic fights for health care and clean energy, opponents of reform have mounted a vicious smear campaign against me. They are using lies and distortions to distract and divide. I have been inundated with calls -- from across the political spectrum -- urging me to 'stay and fight.' But I came here to fight for others, not for myself. I cannot in good conscience ask my colleagues to expend precious time and energy defending or explaining my past. We need all hands on deck, fighting for the future." ...Jones, who joined the administration in March as special adviser for green jobs at the CEQ, had issued two public apologies in recent days, one for signing a petition in 2004 from the group 911Truth.org that questioned whether Bush administration officials "may indeed have deliberately allowed 9/11 to happen, perhaps as a pretext for war" and the other for using a crude term to describe Republicans in a speech he gave before joining the administration. His one-time involvement with the Bay Area radical group Standing Together to Organize a Revolutionary Movement (STORM), which had Marxist roots, had also become an issue. And on Saturday his advocacy on behalf of death-row inmate Mumia Abu-Jamal, who was convicted of shooting a Philadelphia police officer in 1981, threatened to develop into a fresh point of controversy. He is one of the most dynamic activists of our time, and he has a track record to prove it. Jones founded the Ella Baker Center for Human Rights in 1996, a California non-governmental organization (NGO) working for alternatives to violence. In 2005, Jones co-founded Color of Change, an advocacy group for African Americans. Formerly based in Oakland, California, Jones founded Green For All in 2007, a national NGO dedicated to "building an inclusive green economy strong enough to lift people out of poverty." His first book, The Green Collar Economy, was released on October 7, 2008, and reached number 12 on the New York Times Best Seller list. In 2008, Time magazine named Jones one of its "Environmental Heroes". Fast Company called him one of the "12 Most Creative Minds of 2008." From a tech perspective, Jones has set the standard for online book marketing. Social and environmental activist Van Jones felt he had important message about the economy, energy prices and global warming to impart in his book "The Green Collar Economy," which was published this month. What he didn't have, as a first time author with an almost non-existent marketing budget, was the kind of money and name-recognition that typically helps place a book on the best sellers list and in the national conversation. So he improvised. I'm not worried about Jones, he will fair well. He might be more effective as an organizer than a policy wonk. But I worry more for the people who brought him down. Being "green" has finally become a catchphrase in our daily lives. From hybrid cars to organic eating, more people are realizing that environmentalism is the right way to go to make the planet a more sustainable place to live in. However, despite all the green progress, environmental injustices still occur in both industrialized and developing countries. Recently, there has been a spur of online activism through the means of green mapping to bridge the sustainability gap. Green maps were created in 1995 by the nonprofit Green Maps System to empower online activists around the world to locate areas in their communities that are both good and bad for the environment, such as recycling, traffic hazards, community gardens and toxic sites. The system is used in over 400 communities in 51 countries. The system is very simple: users can create a map of their region on the website, and place icons indicating environmental impacts. Using the map created for the Banjul area of The Gambia, one can see where such things as solar energy sites, wetlands and horticulture gardens and clean drinking water sites are located. Hazards can also be seen, such as air and water pollution and waste dumps. Green mapping helps different fractions work together to make the quality of life better for everyone. Many governments and local activists have used their finished maps to proactively address environmental problems in their communities. See the video above produced by Dorst MediaWorks for the Earth Institute at Columbia University about environmental justice activists in New York City. Finally, it's here. As you already know, I am a 2009 Urban Environmental Justice Fellow at the Institute for Justice and Journalism. Here are the first two components - one newspaper article and a photo slideshow - from my project on food as an environmental justice issue.